Friends Arena formerly known as the Swedbank Arena between 2009 and 2012, is the largest sports stadium in Sweden with three different possible seating configurations depending on what type of event is being hosted. 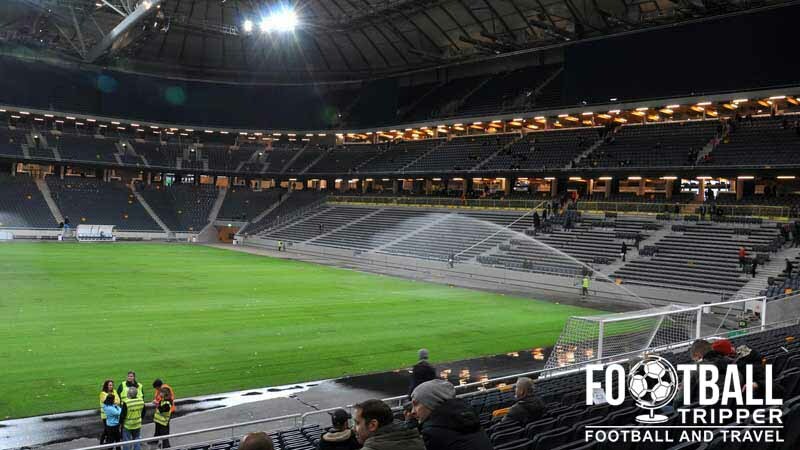 For football matches of AIK Fotboll and the National team the ground has a 50,000 all seating capacity. 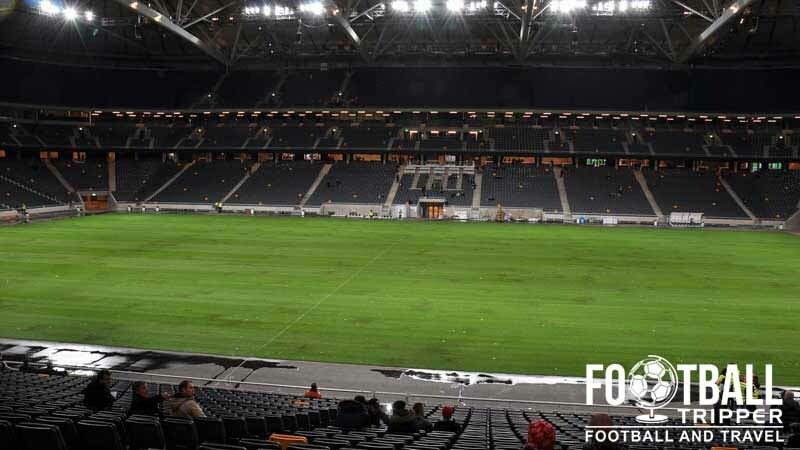 Friends Arena was constructed over a three year period between 2009 and 2012 in order to replace the ageing Råsunda Stadium which previously served as both the home to the Swedish National Team, and AIK Fotboll. First opened in 1937, Råsunda was famous for having hosted the 1958 World Cup Final. Undoubtedly beginning to show its age, the final game was played on 22nd November 2012 between AIK and SSC Napoli, and it was subsequently demolished the following year. 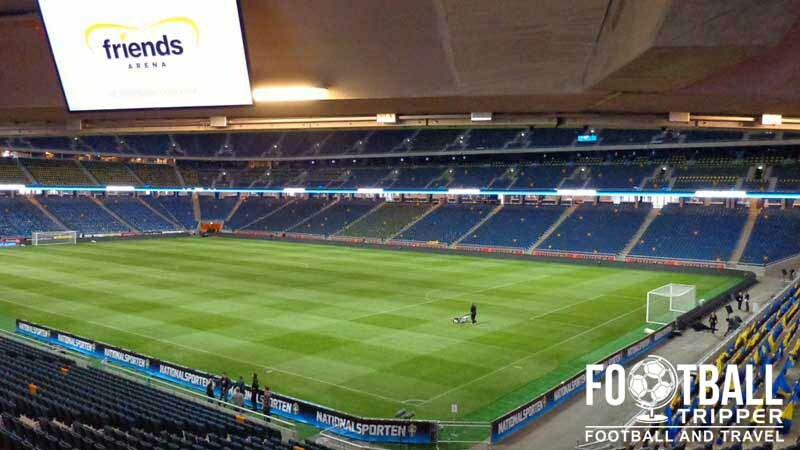 Originally there were plans to locate the new national stadium next to the Ericsson Globe in a move which would have been similar to Wembley, and Wembley Arena, however the Swedish Football Association opted for a more affordable site in Solna. Costing an estimated 2.8 billion SEK which equates to around €300 million, the national stadium was funded by public funding, and is viewed as a long term investment for Stockholm. 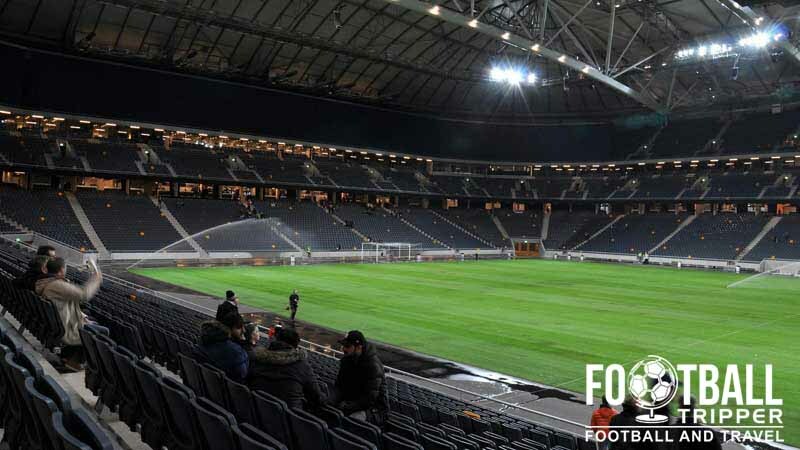 Designed collaboratively with two Swedish architecture firms and Populous who have lent a hand to many famous grounds including Estádio da Luz, Arsenal’s Emirates and Stade des Lumières, Friends Arena is certainly a world class venue. Designed with a retractable roof similar to Amsterdam Arena, and Wale’s Millennium Stadium, the stadium is capable of accommodating up to 65,000 during indoor concerts, and 50,653 football fans per match. The stadium is named after Friends, a charity which aims to tackle the problem of bullying. Swedbank actually acquired the naming rights on a 20.5 million euro deal which will last until 2023, however on 28th March 2012 it was announced that they would donate the naming rights to Friends who are one of their partners. Classified by UEFA as a Category 4 stadium – the highest possible honour, the record attendance to date was set on 14th November 2012 during the inaugural football match between Sweden and England. 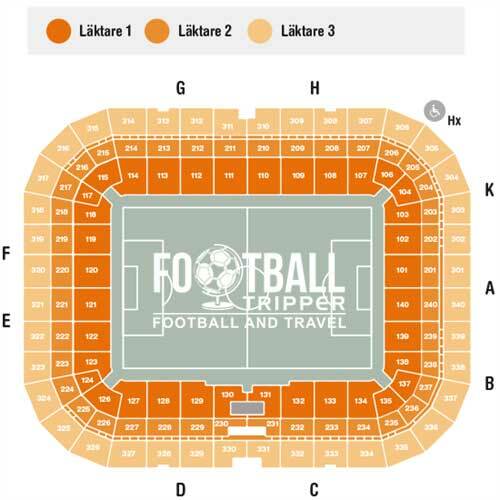 Practically a sell-out, 49,967 fans saw Zlatan Ibrahimovic score the first goal at Friends Arena, en-route to a 4-2 victory over the Three Lions. The Friends Arena is comprised of four stands: North, East, South and West. Carlsberg is the official beer on tap once you get to the ground there is a dedicated Carlsberg Bar located on the south side of the ground between entrances A and K.
Whilst we do know there is a club shop located at the stadium we are currently unsure as to its exact opening times. Rest assured it will be open on matchdays however! Guided stadium tours of Friends Arena are available to the general public several times throughout the year on an inconstant basis. To find out tour availability and to hopefully arrange a visit please send an email to [email protected] or phone the office on +46 8 502 535 00. Tickets for International matches should always be purchased from your national football association. Friend Arena’s box office is usually open between 9.00 am to 1.00 pm weekdays and for up to two hours before kick-off of domestic matches – assuming the game is yet to sell out. The exterior of Friends Arena is out of this world with its space age aesthetics which mean it wouldn’t appear out of place on the moon. Due to the dense urban location and lack of parking spaces, driving to Friends Arena isn’t recommended. If you must park then you will find 4,000 parking spaces at the Mall of Scandinavia nearby but double check the parking signage. From Stockholm Central Station you can catch a commuter service to Solna Station in 7 minutes which will take you less than 1.00 km from Friends Arena. This distance can be walked in anywhere between 10-15 minutes. Whilst the subway system won’t take you as close to the stadium as the train station, many fans prefer it due to the flexibility from around the city. The closest station “Solna Centrum” is around 15-25 minutes away from the ground. No, this is not the nearest Metro Station for Millennium Stadium in Wales but Friends Arena, Sweden. Stockholm Arlanda Airport sits 35 km north of Stockholm and is the largest airport Sweden and third largest of all the Nordic countries. It is well connected to the rest of Europe and the world. The Quality Hotel Friends forms pat of the wider stadium complex and is undoubtedly the most convenient albeit expensive accommodation option. Designed for businesses and conference, however it might not be to everyone’s taste! There are of course plenty more options back towards the main railway station such as the Radisson Blu.